What could possibly make you love your Companion Cube more? Might we suggest filling it with your favorite loose-leaf tea before burnination this time around? You didn't think we knew about that, did you? Well, we do. We know everything. Instead of carelessly throwing it into the incinerator without a second thought, you can now boilinate your trusty Companion Cube, puttin' it in a little hot water just like Aperture did to the two of you what now seems like eons ago. After a long day of testing, nothing tastes better than a nice cup of fresh-brewed tea. But how can you take tea all alone? Well, now there's no reason to. 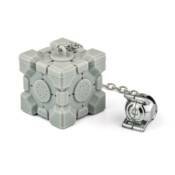 Because your Portal 2 Companion Cube Tea Infuser comes not only with your trusty Companion Cube friend but also with a little personality core counterweight! You can pretend it's Wheatley. You can pretend it's the Space Core. You can pretend whatever you like. Just drink your tea. Dishwasher safe.